Hi all! I`m restored offical thread about firmwares. It is a pity that so much useful information was lost. I hope what together we can restore part information. Also i glad to tell what new version of firmware based on Android 5.1.1 availible for download. I added links in the first post. Attention! It is unstable release. For releasing the final version need to make much more effort, and we hope on your help. Together we can make our devices more usefull for us. Ava do the SD card versions for ut3 have mac1 kodi fix already on the download? @scooter2014, current version of firmware for SD card not included mac1 kodi fixes. Maybe we make special version, after new linux firmware release. But I don't promise. Now we working on Android 5.1.1 releasing, after i think will be release Ubuntu. Should we wait untill the offical update, before trying this? Also does anyone know why you cant turn on location settings some apps need to use it and cant seem to turn it on. Ut3 2.2.0 version any help would be great ty. Also does anyone know why you cant turn on location settings some apps need to use it and cant seem to turn it on. Ut3 2.2.0 version any help would be great ty. In another thread there is a decision. Hi all! The second beta based on Android 5.1.1 is availible! 4. SPMC was replaced on Special version KODI optimised for current firmware. Links for download added to first post. News on official site will be little bit later! Updates by OTA will be availible in the one of the next firmwares. Thank you for your feedback. We have compiled a list of the errors found by you, And in the next release we will begin to fix them step by step..
With best regards, Ugoos team! Last edited by Ava; 11-05-2015, 22:13. Outstanding, looking forward to giving it a try tonight. Thanks Ava and Team Ugoos. please make it possible to use Huawei 3G Sticks on the new Rom,with 4.4.2/2.2.0 it works. Hello Ava and team, My initial results running 3.0.1.b on a UT3 2GB/16GB. 1.) The USB unmount bug is still present. When selecting unmount USB storage, the notification says safe to remove. But when the USB storage device is removed, the notification says it was removed improperly. A reboot is required to get the USB port to recognize the drive again. Sometimes the removed flash drive prompts Windows Disk Check when plugged to my laptop. 2.) Wifi connects after rebooting now, but frequently drops connection. 3.) Plugging in an iPod to any USB port, even if just using for storage, breaks the audio over HDMI, SPDIF and A/V and causes slow downs with video apps, such as Kodi, Youtube, etc. Removing the iPod restores audio. 4.) This may be a Kodi problem, but screenshots made with Kodi's screenshot(Ctrl+s) produces only black, no screenshot of the video playing. the last screenshot shows this. These are my initial results, I'll post any additional bugs I find. Thanks for your work on this Beta, Ava and Team Ugoos. Last edited by RISCy Dude; 11-05-2015, 23:28. Reason: Add info. 1.Language errors in the APP called Settings under Storage stands "Strorage" / Ugoos Settings Install root only one "o"
5.with dataonepart5.1 Parameterfile no Root Folder/Android/data/obb and others/Kodi says "waiting for external Storage/RKMusic says "Flash is busy"
please UgoosTeam still support 4.4.2 ,and what about STAGEFRIGHT,on 2.2.0 i have 4 of 8 vulnerable.PLEASE FIX. Ava just a Notice the UT3 SD card firmware for linux is not linked to sd version its actually linked to the duel boot firmware. Good catch scooter2014. For those looking and until Ava gets the link fixed, it can be found at the Ugoos blog, from this page, the link to UT3 SD boot image appears to be the correct one. It is a Mega link. 1. Fixed few bugs with Developer Options menu item. 2. Fixed unexpected reboot during separate web cameras using (Checked on Logitech C-910). 6. Long hold button function added. 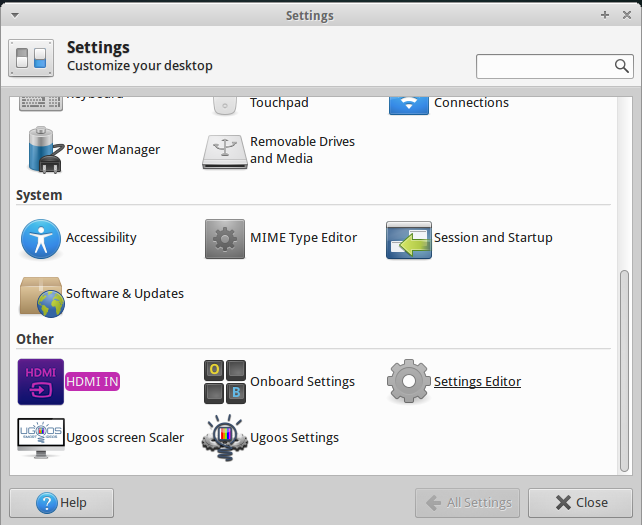 Holding â€œmenuâ€� â€“ bars appeared and disappeared; â€œRecent appsâ€� button activate/deactivate mouse function mode. Yes, not all bugs which you found was fixed... But we will try solve most of them in near time, now we try fix bugs with high priority . About all founded bugs you can write in this thread. With Best Regards, Ugoos Team. Last edited by Ava; 11-23-2015, 21:14.